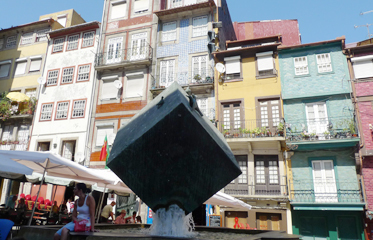 In the oldest part of aincent town of Porto, first Portugal capital, this square is keeping authentic old Ribeira area [by the river] very vibrant. We were there in the time of the world football championship and for the whole month this square was converted to the live TV show on the most popular country wide channel, with the idea of helping everybody taking its place in the game. We were witnessing for couple of hours live perfomances of music and dance groups, with animated paticipation of huge number of locals.Football is extremely popular and important social event. Interestingly every single cafe, restaurant or any other establishment with more than two seats had large TV on at all times, with all the games and repetition of those between playing times. Even without your will you are participating in cheering for some team, constantly reminded by the groups of people of the scores and prospects of any imaginable country. True global spirit.